Deen Dayal Upadhyaya Gram Jyoti Scheme is one of the many rural development schemes started by the central government of India. Under this scheme the government will provide 24×7 power or electricity to the rural areas.The Deen Dayal Upadhaya Gram Jyoti Scheme can be called the extension of Rajiv Gandhi Grameen Vidyutikaran Yojana. Supervision Ministry of Power, Coal, New and Renewable Energy. Total scheme fund outlay Rs. 76 thousand crore. Grant provided by Govt. of India Rs. 63 thousand crore. 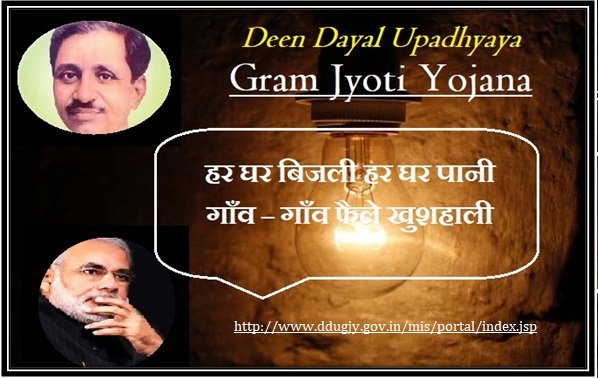 Agricultural Feeder separation under the Deen Dayal Upadhyaya Gram Jyoti yojana (DDUGJY) : There are few components associated with the DDUGJY scheme launched successfully throughout the country, which aims to total electrification of the nation, mainly in the rural areas. Feeder separation in agricultural is one of the major components of this scheme. With this component, the Govt. will be able to separate all the technical infrastructures associated with the agricultural consumers. This will make the non – agricultural components independent and will have better electrification facilities. Efficient rural electrification under the DDUGJY can only be obtained via proper measures of feeder segregation because cutting off of agricultural power supply will not result to cutting of power supplies to homes, schools, etc. Thus, the household will get ample amount of power supply, even if agricultural power supply gets interrupted. DDUGJY satisfying increasing power supply demand :The demand of power supply, mainly in rural areas was increasing day by day throughout the nation. As a result of which, frequent load shedding and power shortage was inevitable. The new DDUGJY scheme in India was a launched which was treated as the permanent solution to the power owes in the nation. Day by day, the population of the country is multiplying, resulting in exponential increase in power demand. The Govt. if worked with the traditional techniques or power management and distribution would never be able to cope up with the situation. Hence, the DDUGJY scheme is a revitalizing technique to bring reforms and modernization in power production, transmission and distribution not only in the cities, but also in rural areas. Modernization of sub – transmission techniques under the DDUGJY scheme :Sub-transmission is a very vital technique which is implemented in power transmission system. The sub-transmission is a low voltage power transmitting technique which is used because the main transmission systems carry higher voltages and it is not efficient to transmit it. Hence, the sun-transmitting is used to convey the power supply onto the semi rural and rural areas. The DDUGJY scheme aims to regroup and strengthen the sun-transmission system in the country so that, less loops in the power transmission system can be obtained, resulting in efficient electrification of the areas. Improving the distribution network under the DDUGJY scheme : Earlier before the launch and implementation of DDUGJY scheme, it was seen that the distribution companies / agencies which were assigned to do run the distribution part were underperforming due to several issues, one of them was lack of proper funds. Hence, the Govt. wanted to improve the power distribution network across the country under the DDUGJY scheme. A major chunk of the corpus allocation of DDUGJY scheme will go for financially strengthening the distribution network to achieve high electrification of both rural and urban areas. Metering consumers under DDUGJY scheme : Under the DDUGJY scheme, one very important step was taken by metering all the consumers throughout the nation. This will not only bring transparency in the system, but also will save Govt. for further incurring huge losses due to illegal power and electricity consumption. The commercial viability of electrification of entire nation will be done through this metering process. All categories of consumers, be it a single household or an industry must have metered power supply under the DDUGJY scheme. The scheme will fetch Rs. 76000 Cr for the implementation. Rs. 63000 Cr among this hefty amount will be paid by the Indian central government as a grant. The as of now nearly 14680 Cr has already been approved by the central authority. Among this approved amount Rs. 5827 Cr have been approved only for the state of Bihar. As it has been seen that Bihar is one of the backward states in India, especially in case of agricultural development, the central has allotted this much of amount for Bihar under this scheme. The PM of India has selected Patna, Bihar as the place to launch this dream project. The DDUGJY scheme has completed almost one year of operation in the country. A similar scheme was already functional in the state of Gujarat, before this scheme. After the full implementation of DDUGJY, the rural households will have uninterrupted power supply. The rural consumers, specially the domestic households suffered frequent load shedding, which can be stopped. This will improve the services related to education, industrialization, health, transportation, banking, etc. Apart from this, the feeder separation will also be achieved through the scheme. Metering of consumers will help proper fund utilization and bring transparency. Sufficient electricity will bring up the amount of annual agricultural production. This will lead to more business opportunities in the rural areas and more employment generation in the grass root level. Schools, hospitals, health care centres and other commercial organisation will get electricity under the scheme. This will enhance the education system, health care system, banking and other commercial activities in the rural area. Communication such as telephone, internet, radio, television and mobile phones will also be accessible in rural areas. With this scheme, communication with parts of the nation will be easier for many. Along with social security, many other parts of rural areas will be developed with the implementation of this scheme. If major parts of the nation get sufficient power the scenario of agricultural production will be more developed. According to the recent reports in 2017, nearly more than 99% of the total villages get electricity supply under this scheme. As per the census report there are 5, 97, 464 villages in India. Among all these villages 5, 94, 011 villages have been said to be electrifying in last few years. This measures 99.4% of the total census villages in India. In Bihar, 99.3% of total villages have been electrified under this scheme. Uttar Pradesh and West Bengal show 99.9% of the total villages where Andhra Pradesh has shown 100% electrification under the scheme in India. For state-wise detailed report one can click on the link: http://www.ddugjy.gov.in/portal/index.jsp .